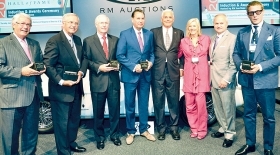 The Automotive Hall of Fame presented five induction awards and recognized five other honorees at its annual ceremony last week in suburban Detroit. From left: Neil De Koker, founder and CEO, Original Equipment Suppliers Association; Dave Cole, chairman emeritus, Center for Automotive Research; James McElya, former CEO, Cooper-Standard; Bo Andersson, CEO, GAZ Group; former General Motors Vice Chairman Bob Lutz; Sheryl Kammer, the grandniece of former GM designer Harley Earl; Brook Bacon, operations manager of the Americas, Aston Martin, who received the award for Aston Martin founders Robert Bamford and Lionel Martin; and Lapo Elkann, president and founder of Italia Independent Group. Former Formula One driver Jackie Stewart, not shown, also received an induction award.